10x10 is a company that brings together recruiters and engineers. They curate jobs and possible career paths for engineers while also helping recruiters to find and hire engineering candidates. However, they don’t have a mobile app. 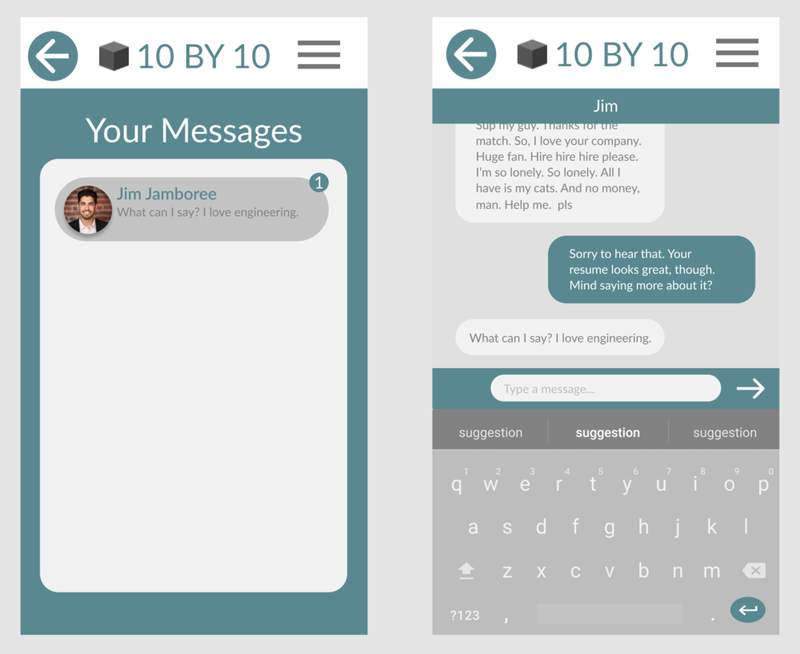 The mobile app was initially designed to create an easy-to-use tool for engineers and recruiters to communicate and become a part of a community. The company’s goal is for 10x10 to be a platform for casual networking, so it made sense to create a social app that was simple to use and connect with others. The design was broken up into two experiences: that of the recruiter and that of the engineer. Although there are similar chat, search, and profile creation/viewing functions, they were different experiences depending on the persona; two different branches to each function. After three rounds of user experience testing through UserTesting.com, where users were given three different tasks to perform by navigating through the prototype some changes had to be made for the final product. Adjustments to the “hamburger” menu, iconography were made and the profile editing function was refined.